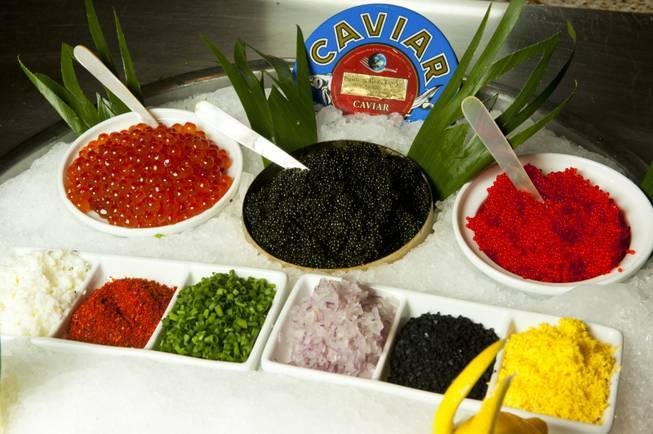 The Hotel Bellagio in Las Vegas, which has some of the most expensive rooms in Las Vegas is now offering a Caviar buffet which will allow you to eat as much of the expensive appetizers as you can! The options are quite a few including the American sturgeon caviar, red flying fish tobiko caviar, and salmon roe all for a fee of $38. Although buffets are all you can eat, the chefs recommend that customers take the caviar in small bites. To help novices, the chefs serve an appropriate amount on blinis and mini-waffles with traditional accompaniments such as chopped egg, red onions, chives or creme fraiche. “We do have some people who come up with a bowl and want us to fill it up,” Ortiz said. “But we like to respect the integrity of the dish.”But just to ensure that people come to enjoy the delicacy in the particular style, an attendant chef will ensure the right quantity is served atop house made blinis, buckwheat waffles, freshly rolled sushi, and ahi tuna cones. All are available Fridays and Saturdays during regular buffet hours, 3:30 p.m. to 10 p.m., and are included in the $38 dinner price. The Bellagio added the caviar bar to try to keep pace with its competitors. Caesars Palace recently debuted a new buffet and the Aria renovated its buffet.